Many people are either new or relatively inexperienced to violent protests, and considering what is happening these days, you might want to get close to the action and see what is happening or maybe even join the fighting yourself. Before doing so, it’s essential to know how to do it right. If you take it lightly, you could end up seriously injured, incapacitated or even dead. In this post I will go through how to prepare and protect yourself from attacks by the Central Security Forces (CSF) and the Military forces, as each uses different weapons and strategies. Scarf (palestinian-style) – To protect your neck and to coveryour face if needed. Don’t wear contact lenses, make-up, moisturizers or vegetable/mineral oil-based cream, it will bind the CS on skin and can boost up the skin irritation. Plan your escape – Look for easy exit routes where you can run freely without getting stuck. 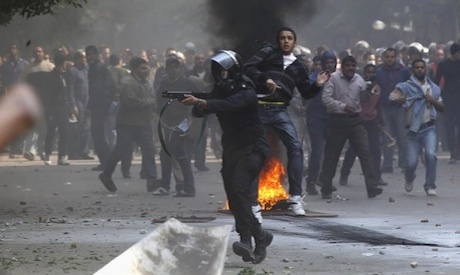 CSF mainly use long batons/sticks, tear/nerve gas and shotguns (both live and rubber bullets). They also commonly throw rocks. Military mainly use long batons/sticks, electric batons and assault rifles. Tear gas is not hard to avoid as long as there is a breeze or some wind. If the wind is stale, try to stay away from tight alleyways and be in open areas. When a canister is shot in your direction, STOP, do not run. Look up, watch where it will land, and only move if it will hit you. Once it goes down and the gas starts coming out, look at which direction it is going. By this point most people in the crowd will be running away like crazy to avoid the gas, but many of them will get stuck in it. All you need to do is walk the direction opposite of the wind, or if you need to escape, quickly sprint around the gas before it spreads to cover your exit. When you run, try to hold your breath and tighten your eyes to avoid inhaling any gas by accident. If you are forced to run through the gas, then do it extremely fast and DO NOT BREATH. In case of being stuck without anywhere to go, do not go down, keep your head high since the gas is heavier than air. Breath as slowly and calmly as possible and move as slowly as possible to avoid increasing your breathing rate, and do not panic. Also, tighten your gas mask as much as you can with your hand. The most important thing here is to not start running until you see where the canister lands and where the wind is taking the gas. This is the key to not getting stuck in a cloud. If you decide you want to move the canister, then you can either kick or throw it. Before you kick, look at where the wind is going, come from the same direction as the wind and then kick it back to the CSF. If you want to hold it, do the same thing with the wind but NEVER stand still with the canister in your hand. You will need to both sprint and throw at the same time, since if you stop in your place the gas will be all over you. Even if you throw it very quickly, you need to move away from your spot very fast right after. Whenever you are in a fight that includes guns being shot, first thing to do is ALWAYS make sure that there is another person or object between you and the shooters. If you are walking, walk behind another person, and if standing, try to take cover. If you see the person infront of you going down, then you need to find cover fast. I have personally been in at least two battles where this rule saved my life. It’s a dirty trick, but it works. When it comes to running away, always run in zig-zags. It makes it much harder to aim at you. Rubber bullets will normally not puncture your skin if you are not very close, though will sting and can be stopped by your goggles/mask or clothes if you are far enough. Live shotgun shells will be much worse and especially at close range. I have been in several battles with the military where they were freely shooting their AK-47s at us. There isn’t much you can do really…duck, take cover, hide, run in zig-zags…just get out of their line of sight. Also, having another person between you and the bullet helps a lot as experience has taught me. Standing behind another person won’t necessarily help you in this case, and standing to look where the stone will land is also quite useless since there will be too many and you won’t see them well. This leaves two options, either you sprint back and stay a safe distance away from the stones, or you find cover. There’s not much you can do here. Always cover your head with your arm and look away from the stones so they don’t land in your eye. It is also common for protesters to hit and injure other protesters with their own stones by accident. Not everybody can aim well or they may overestimate their throwing distance. So whenever there is stone throwing, first check if people are throwing from far behind and stop them if they are hittin gothers, and try to stay away from the front line because that’s where a lot of the stones land from behind. There’s two ways to do this…the safe way, and the dangerous way. Either you act like Rambo and grab somebody and beat the crap out of him, or you get out of the way. I would suggest the latter, get out of the way, create distance, then throw rocks/molotov cocktails from further away where you can be safe. Rambo normally doesn’t make it out in one piece. When it comes to electric batons though, just get out of the way. You’re much more likely to be incapacitated immediately by the electricity than you would by a stick. Finally, always stay safe. Take your precautions well, never panick, always think quick before you move. If you don’t panick and take a moment to assess the situation so you can clear your mind, think fast and well and get to safety faster than everybody else. I took this video last night in Falaki street during a battle with CSF. They were shooting heavy tear/nerve gas at us and rubber bullets/shotgun shells. As you can see, I was standing with a building entrance to my right where I would regularly take cover from gunfire. Around 2:24 two tear gas canisters are shot behind me, which would block my only entrance. Since the air was going to blow it away from me, I would be safest not running away and staying closer to the fight. Then I quickly ran towards the canister to be as far away as possible from the gunfire, while staying right before it to avoid the gas actually being blown my way. This kept me in a good position until I felt it was safe to move foward again. You can see how all the other people who used bad strategy panicked and ran straight into the gas. Whenever there were shots, everybody ducks down and takes cover. I also always made sure there was another person standing infront of me whenever i went out in the open. Around 2:53, the man standing infront of me was shot by a rubber bullet (that would have hit me if he wasn’t there) and you can see him holding his side in pain around 3:01 walking away. This saved me from taking the bullet myself instead. If you look closely in this and in other videos, you will see how these tips can be very helpful. Feel free to ask any questions or make any comments/additions for me to add. For more of the above, follow @amrbassiouny on Twitter. viva tunisia egypt syria lybia viva la libertad!!!!!!!! Good gas masks as in your pic are helpfull, those white dust masks, that I can see lot on the pics are relatively useless. They are made for much greater particels than gas, you start sweating under them, they’ll get and have to put them down. Stay safe, and kick those SCAF asses!. Solidarity! Thanks a lot for this excellent response. I will add some of your tips to the article. Another one from Germany, Berlin. Stay steadfast, stay brave, stay on track. Try to gain maximum political support. And – don´t use slingshots. Try to avoid casualties on the other side, because that would only benefit the military council. I still smile at a friend’s recollection of rioting in Berlin many years. Amidst the chaos, there was the sound of marching. He turned around and there was a battalion of Lesbian Feminists with pink triangles on their helmets. All too were booted and leather jacketed. They split into two rows. One kneeling. One standing. All wielded sports catapults and large steel ball bearings. With awesome military precision, the front row fired as the back re-loaded and vice versa. The decision to use them is up to you. Take care and the best of luck to you all. That’s a good point right there. I made a research on the topic and found most people will agree with your blog. By the way I will subscribe to your feed and I hope you post again soon. I’m glad to hear you found it useful. I wrote this all based purely on my experience, so it should be perfect for dealing with Egyptian security/military forces. Hello from Brazil! Thank you very much for sharing these tips. I’m not really into violence, but it seems our police is. And it doesn’t harm to have the knowledge anyways. Good luck to you and the ones who share your cause, bro! By the way, marbles (those small toy balls made of glass) are good for cavalry – either real horses or motorcycle. Breathing through vinegar also reduces the effectiveness of tear gas, and antacid (like mylanta) are useful for applying in eyes / mouth after the gas has made it’s effect.